I want to provide some insights on recent news from our nation’s Supreme Court. The court has issued several rulings that have impacts on people in our state, most notably the changes to how public-sector unions operate in what is known as the Janus decision. During the 2018 legislative session, we all knew the court was considering this case and the ramifications would be significant. That’s why the Senate Majority did everything it could to pass laws to shield union bosses from the effects of the case. We uncovered a confidential memo from union leaders to the Governor explaining what they needed and how to get around a ruling not in their favor. Now, public sector workers in our state will have more freedom to choose. The Janus case hinged on whether unions could force public employees to pay certain types of union dues. There were concerns about what are called “agency fees,” collected from workers who opted to not join the union as a condition of keeping a job. The reasoning was that those employees still benefited from the collective bargaining of wages and benefits even if they didn’t support the union’s political activities. After Janus, unions will have to do the same things that all associations do – prove the value of joining to prospective members. The Supreme Court ruled that workers must give affirmative consent to have their wages garnished to pay union dues. 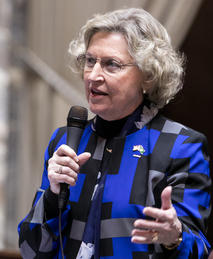 Senate Republican Leader Schoesler sent several letters to Governor Inslee asking how he will implement needed policy changes to protect public employees’ First Amendment rights. While other states have already begun putting more money back into workers’ paychecks, our Governor has gone silent. However, the state’s HR department has indicated that these deductions will end. I will continue to provide you updates on news from Olympia. Although the Legislature won’t convene until January 2019, I serve on several interim committees that meet regularly to discuss policy needs of the state. This includes looking at our state’s pension policy, military and veterans’ affairs, and issues around aging and disability. It was so great to see many of you throughout our community this month. I attended numerous events and parades, and am looking forward to more opportunities to connect with you. I’m planning on hosting coffee talks around the district later this summer. Please keep an eye out for future newsletters with more details. 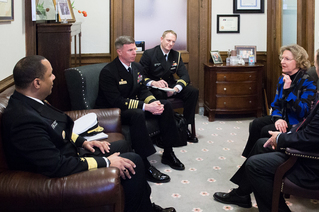 NAS Whidbey is a cornerstone of our community and on the forefront of our nation’s defense. The leadership at this installation will soon be changing, and I want to thank the hardworking men and women for their service to our community. I’m proud to have sponsored the Navy Day resolution for many years that honors our special relationship with the Navy. Sometimes our work in a Olympia takes a while to come to fruition. I'm pleased to announce that due in part to my work on the 2015 transportation package, we will be getting a new ferry for the Mukilteo-Clinton run. It is also worth noting that part of the ferry was built right in our community! Our district is heavily dependent on ferries to get people where they need to go. I’m looking forward to the benefits it will have on our transportation system in the 10th District. You can read more about the new ferry by clicking here. It is an honor to serve as your state Senator. Please don't hesitate to reach out to my office with any questions or concerns regarding your state government. Please follow me (@SenatorBarbaraBailey) to receive updates on my work here in Olympia. Please be sure to subscribe to my newsletter if you have not already.. You can unsubscribe at anytime by clicking here. Feel free to share this with others that live in our district. You can forward this e-mail to them or click on the share button below. You can also read previous editions of my e-newsletter by visiting my website.